A few days ago I told you about collecting Chestnuts and also about Chinkapin. Today I'll share a couple ways to roast chestnuts. ...this is a chestnut bur, which holds the tasty nut. As you can see, I use tongs to pick these things, those barbs are extremely sharp! The bur will be green on the tree...after letting them ripen and open, you carefully extract the nut (so as not to get stuck with those sharp barbs). Most of the time, the burr will brown as it ripens and opens, but not always. We had twice as many nuts in our basket, but Johny left it outside overnight and a scavenger came and stole them...maybe that's why the chubby little chipmunks keep coming up to the front porch now! We know for sure we've collected both American and Chinese Chestnuts, but we have differing opinions about which is which...but they taste the same to us. ...make sure you get through to the meat. Put them in a pot and put just enough water to cover them. Bring them to a simmer and turn off the heat. You can add salt, but we prefer not to. Put them on a baking tray and roast at 425 degrees for 15 - 20 minutes. Remove them from the oven and cover with a towel for about 5 minutes to allow them to steam, and enjoy! So good! ...and ended up burning the nuts a little..
...but they were still good. There is nothing like fresh roasted chestnuts, and the store bought chestnuts just can't compare. Yet another reason why life is good here at our cabin and I am a lucky girl! Oh, you are indeed lucky to have a Chestnut tree! I love them. We had Chinkapin bushes when I was a child. I loved eating them and called them "little chestnuts." We roasted the chestnuts but ate the chinkapins raw, biting the shells with our teeth. 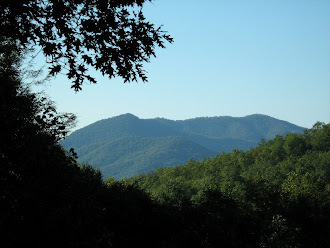 I know we are lucky NCmountainwoman, there aren't many left in these parts! Sounds really good...more Thanksgiving treats! Hugs!